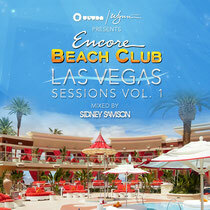 Dutchman Sidney Samson was recently asked by Ultra Music and Wynn Las Vegas to mix their first ever compilation – 'Encore Beach Club: Las Vegas Sessions Vol. 1'. Featuring 15 tracks, the mix is a great way to experience and relive some of the greatest moments from one of the world’s premiere day clubs. Sidney Samson was lead producer on Shakira & Pitbull’s newest track ‘Get It Started’, which is currently going up the Billboard Hot 100, he also recently completed the mammoth LMFAO North America tour alongside fellow Dutch act Eva Simons, Far East Movement and Matthew Koma. Featuring global hits such as ‘Raise Your Weapon’, ‘No Beef’ and his own worldwide smash ‘Riverside’ – the compilation sets the scene perfectly for what many tout as the greatest daytime club experience in the country. As Sidney prepares to embark on a mammoth tour of Australia and Asia, the release of this compilation should further cement his position in the DJ world.